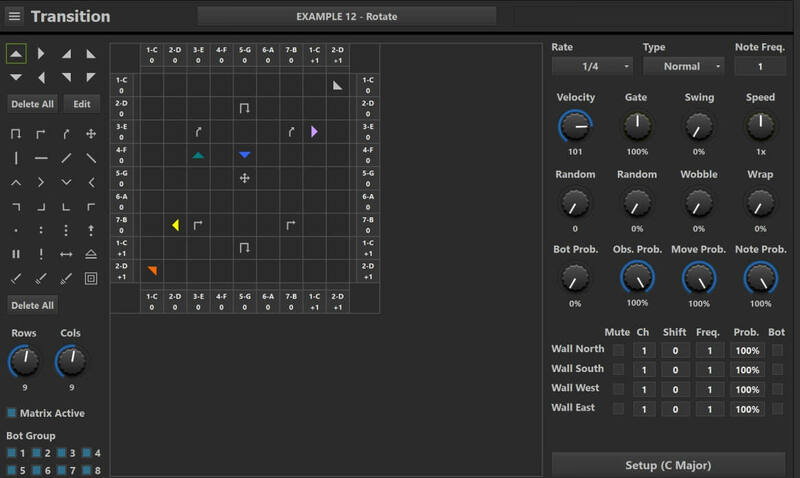 Transition is a generative MIDI sequencer. The basic idea is that bots move through a matrix of cells until they encounter a wall, another bot, or an obstacle. When a bot hits a wall it will trigger a note, or a chord. The note/chord is based on the scale degree and octave settings of the wall cell. The output can be transposed up or down within the selected scale by incoming MIDI notes. When a bot crashes with another bot they will both change direction. When a bot encounters an obstacle the effect on the bot is based on the type of obstacle (for example it can change direction, jump to another part of the matrix, change speed, or pause movement). There are numerous settings you can edit to control the behavior of the bots and the MIDI output they generate. The various randomization features allows you to create more interesting and unpredictable output. Most of the parameters can also be automated. Transition gives you an interesting and fun way to come up with new musical ideas. It can produce a chaotic random result, work more like a standard step sequencer, or something in between.